Pixar has always been at its best when telling stories about family. Sometimes its strongest stories are about literal familial bonds—Finding Nemo deals with a father desperate to protect his son, while Ratatouille and The Incredibles center on protagonists who want to pursue their dreams without letting down their dubious, reluctant families. Sometimes they’re about individuals creating their own families—the toys in the Toy Story films bond, protect each other, and squabble just like blood relations. Their interdependence runs deep enough that they feel a personal sense of betrayal and loss when their convictions take them in different directions. The ersatz father-child relationships in Up and Monsters, Inc. give the grumpy faux-fathers in both cases something outside themselves to live for, and a new way of looking at the world. In each case, the stories focus on what the characters expect from their families, and from themselves in relationship to their families. And in each case, the films draw strength from the innate emotional power of those connections. The latest Pixar film, Brave, returns to literal kinship for what should be a deeply felt story about a theme Pixar has never explored before: the tension between a mother who has a life plan laid out for her child, and a daughter who wants to control her own destiny. At its best, Brave accesses all the complicated feelings involved between a parent and a rebellious adolescent: the mutual frustration, the lack of communication, the way conflicting desires can mask love without weakening it. But Brave goes to that deep emotional well too rarely; it spends more time splashing in the shallows. Granted, they’re beautifully rendered shallows. Attention to visual detail, from finely rendered textures to highly individualized characters, has always been a Pixar hallmark, and Brave is no exception. Pixar has been touting the effects of its new proprietary PRESTO animation system, and Brave feels like a PRESTO showreel as much as a film, particularly when it comes to the protagonist’s distractingly vibrant, oversized mop of curly red hair. In keeping with modern high-end CGI animation, every blade of grass is lovingly rendered, and even the backdrop characters have personality. Pixar’s films remain rich visual wonderlands, artworks in their own right. But with Brave, the content doesn’t entirely live up to the rendering. The film focuses on Merida (voiced by Boardwalk Empire’s Kelly Macdonald), the teenage princess of a clan in ancient, era-undefined Scotland. Her father Fergus (Billy Connolly) united the local clans in battle against outsiders, and her mother Elinor (Emma Thompson) intends to keep them united by marrying Merida off to the prince of one of those clans, based on who wins a contest of prowess at a local gathering. Merida is a wild child who takes after her doting battleaxe of a father more than her prim, controlled diplomat of a mother, and she chafes under Elinor’s strictures about how a princess should behave. Eventually, she takes drastic action to evade her mother’s betrothal plan, by seeking out a magic spell to change Elinor’s mind. Naturally, that spell has dramatic, unintended consequences. But its biggest consequences are finally kicking the story into gear after a long buildup that relies too much on action-as-spectacle, storytelling gimmicks like an Elinor-nagging-Merida montage, and pacing that’s meant to be stately, but occasionally just drags. 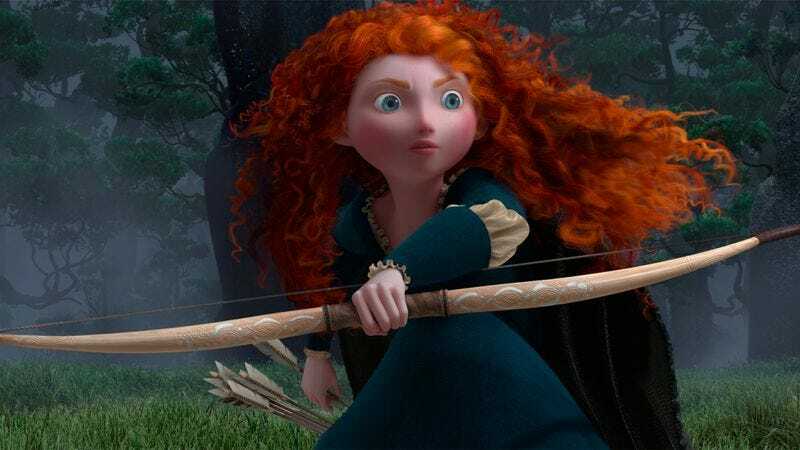 The film is packed with comic routines, slapstick, and general goofiness involving Merida’s three tiny über-troublemaker brothers, the fractious clan chiefs (voiced by Robbie Coltrane, Craig Ferguson, and Kevin McKidd), and the wacky witch (Julia Walker) who provides Merida’s spell. Once that spell takes effect, Brave appropriately becomes magical—but that story turn comes later than it should, and after so much humor that it initially blunts the drama. And for all Brave’s slow buildup, it never manages to fill in some of the most important details. Merida’s resistance to her possible betrothal is immediate and vehement, but never particularly explained. “I want my freedom,” she moans, but it’s unclear what, if anything, marriage means to her, and how it affects that freedom. Older viewers could certainly make their own connections, given women’s historical role as property and bargaining chips, and the relatable modern desire to choose a partner for love rather than accepting a forced marriage for political expediency. But the whole marriage-threat issue may go over kids’ heads, particularly since Elinor is such a solid, present figure in Merida’s life, one kids can probably relate to. A husband, on the other hand, much less an arranged marriage, is only an abstract. And given how thoroughly Elinor dominates her husband, a booming mountain of a man who defaults to a meek “Yes, dear” when Elinor gives him a fierce look, it’s unclear why a husband might get in Merida’s way, particularly by comparison with a mother. Meanwhile, the film mines drama and tension from an extremely underdeveloped plotline involving a past clan fracture and a killer bear; the whole plot exists largely as metaphor, but the film’s ending offers a payoff that the setup doesn’t entirely earn. These kinds of lapses don’t seriously harm the movie, but they do enhance the feeling that it’s skating along a series of broad stereotypes—martinet mom, browbeaten but resistant dad, rebellious teenager, bratty kids—without finding the depth in them that, say, The Incredibles did. The first half of the film spends too much time explaining who the characters are, and not enough time observing them. For much of the film, Merida is more a story function than a character. She’s fun, but not nuanced; that mane of constantly shifting hair is rendered with far more layers and detail than she has. Essentially, until the spell kicks in, Brave’s story stakes and its emotional connections are implied more than felt, and they’re largely in the hands of a character who’s flighty and selfish just as often as she’s confident and determined. As the spell begins to kick in, and it seems possible that it’s simply poisoned Elinor, Merida flits around her increasingly ill mother like a hyper bird, chirping variants on “Yes, you kind of feel like you’re dying, but have you rethought that whole forced-betrothal thing?” She isn’t meant to be the most respectable of heroes, but the film goes a bit overboard in making her a one-note one. Still, thanks to an ending that finally trades on those oh-so-evocative family bonds—parents’ desire to protect their children, children’s desires to be heard even when they can’t figure out how to fully express their frustration and disenfranchisement—Merida’s ultimate redemption packs a powerful punch. A score heavy on traditional Scottish music and a modern take on Gaelic folk underscores the emotion, and the gorgeous visuals do a lot of the heavy lifting as well. But until the endgame, Brave feels strangely conventional for a Pixar film, and too light to earn the serious impact it wants to have. It’s deeply tempting to blame the film’s bifurcated feel on its two directors—Brenda Chapman, the original director, conceived of the film based on her relationship with her daughter, but was fired from the project. Pixar storyboarding vet and first-time feature director Mark Andrews, who previously directed the Oscar-nominated Pixar short “One-Man Band,” took over partway through the production. Given Pixar’s organic, collaborative method of story-building, it’s far too simplistic to attribute the mid-film change to the mid-film directorial switch. But the not-always-satisfying end results suggest a film with multiple agendas and visions that don’t fully work together. It’s a lovely picture, but the frame could use some straightening. Two notes: 1) Brave screens with an opening Pixar short, “La Luna,” which was up for last year’s Best Animated Short Oscar; it was written and directed by first-timer Enrico Casarosa, a Pixar vet from Ratatouille and Up. It’s a sweet little fillip that accomplishes in seven minutes a lot of what Brave does over 93, by illustrating how families have expectations for their children, but trusting the kids to find their own ways might bear solid results too. As a side note, the business with the two kinds of star-sweeping brushes is a beautiful bit of concise, efficient, yet funny characterization. Brave could have used a little more of that show-don’t-tell kind of observation. 2) Completists will want to stick around through Brave’s credits for a bit of non-crucial but amusing story wrap-up at the end. For thoughts on, and a place to discuss, plot details not talked about in this review, visit Brave's Spoiler Space.